It must always be remembered when considering hanging lamps that there is no end to the range and variation that Edward Miller developed when producing these lamps. His production techniques ensured that the vast majority of parts were interchangable. His customers could 'pick and choose' to their liking and the lamp would be built before their eyes. As a general rule this was also the case for other brands and the industry had 'standard sizes' which was to everbodies benefit, particularly the customer when replacement parts became necessary. Just because a lamp has a 'Miller' removeable fount, does not mean that it is a genuine 'Miller lamp. Each major manufacturer identified their work through their brass embossing and rollwork. correct identification of a lamp is further complicated by the fact the Miller, along with his competitors would often sell particular parts to wholesalers who would then 'build their own' lamps using a mix of different parts from different manufacturers. 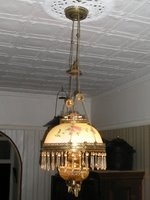 This is the largest lamp made by Edward Miller and Company, Meriden Connecticut U.S.A and is fitted with a No. 3 central draught burner, the largest made by Miller. Designed to be suspended from an iron frame and hung from the ceiling using a fixed hook. It did not have a raising or lowing device and was never made to be a table lamp. The font can be removed downwards through the ring without taking the frame from the hook. 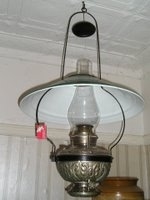 This lamp was designed for use in stores, school buildings or public halls where a large amount of light was necessary. The economy of burning kerosene was not such an important issue however robustness was. These lamps were nearly always nickel plated brass (to save on polishing) and were fitted with a tin shade (to save on breakage). The burner on this lamp is huge and when lit gives off a considerable amount of heat. The lamp is rated to 300 candle power and the font holds 1 gallon of kerosene (4½ litres). When set on an ‘average’ flame height it will burn for 12 hours before re-filling. Like all such ‘Miller’ lamps, the burners have a raising device allowing for them to be lit without removing the chimney. Unlike any other hanging lamp Edward Miller altered his wick adjusting mechanism for these large lamps to allow adjustment of flame height from underneath. An example of the superb embossing and brass work that the Miller Company was capable of, every square inch of brass on this lamp shows excellent craftsmanship. Made of no less than 40 individual pieces this lamp is of excellent design and appearance whilst maintaining function. 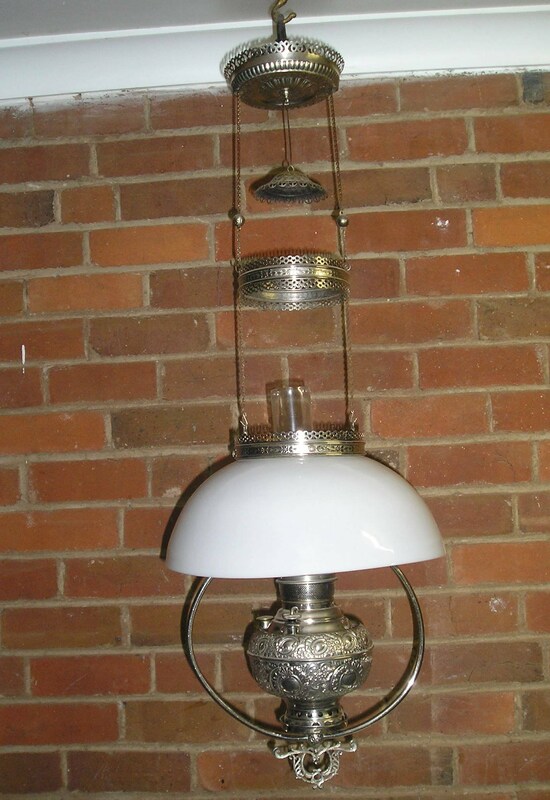 A very scarce lamp, this lamp pre-dates the more common parlour lamps raising mechanism (clutch). Given the ingenuity of the clutch, not many of these early counter-weighted lamps were ever made. 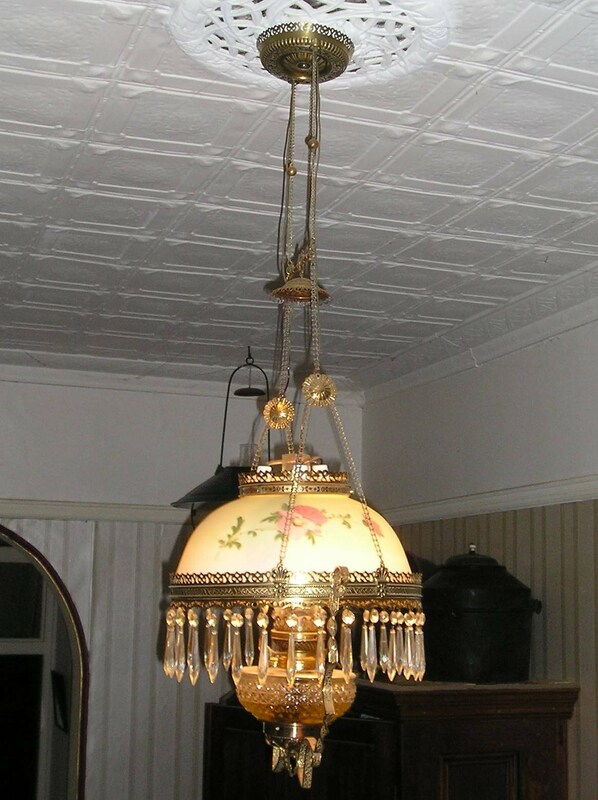 Displayed with the original 14” dome shade which hangs suspended by three small screws in the shade crown. Every part of this lamp is functional, even the finial at the very bottom of the lamp, known as a pull-finial, is to enable the lamp to be easily pulled lower for lighting and filling. It is fitted with the No.2 burner and A1 quality removable font. The counter-weight is very heavy cast iron with an embossed brass shell. A lamp such as this, being top quality, yet plainer than a parlour lamp would most likely have been used in a formal dining room. This example shows the well known style displaying the original matching hand painted shade and vase, finely cast brass flowers and matching (spacing ring, crown and shade ring) ornately embossed rolled brassware . The lamp has a removable A1 quality ‘Juno’ font & No. 2 rosette burner and dates from c1896. It has a hanging depth of some 5 feet. A lamp of true decadence – the crystals provide an ultimate touch. This lamp uses Miller’s patented ‘clutch raising devise’ patented in 1892. This devise enables a lamp to be raised and lowered without the use of a counterweight. A lamp of this type, where no expense has been spared, would have hung in 'pride of place' in the sitting room of the well to do household. This lamp is yet another example of the ‘immense range’ produced by the Miller Company. A scarce lamp - it is a genuine Miller duplex (double flat wick) hanging library lamp – a deviation from the central draught lamp. Interestingly the cut glass font also bears the ‘E M & Co.’ mark which makes one wonder if he also undertook glass manufacture? Again this lamp is fitted with the patented 'clutch raising devise' but instead of a spacing ring, is fitted with a spacing arm. Although not clear in the photograph, the delicate hand painted shade has a pattern of leaves and pink flowers. 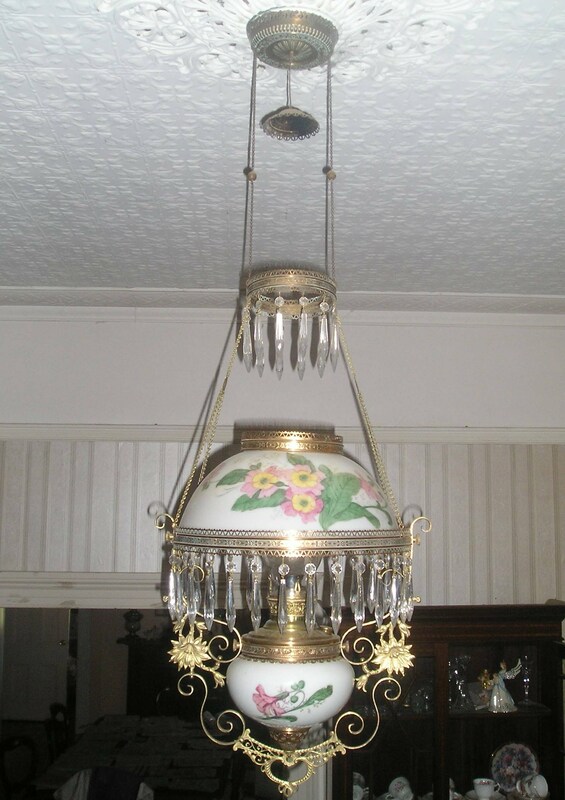 Along with the rolled patterned brassware, matching crown and shade ring and crystals this lamp certianly would have looked its part in the library or sitting room of a well to do home. An example of a simpler style of hanging lamp, and far more practical for every day use. A nickel lamp to illiminate the need for polishing the font is identical to the standard embossed #2 table lamp, but instead of a stem and base fitting, it has a small bracket. This bracket is attached to a mounting plate by a small retention screw, thus allowing for the simple removal of the font for filling. The lamp hangs on a loop of plain nickeled brass tubing with no shade ring. The plain white shade is original and suits the nature of the lamp. Although still ornate it is made for the middle market. Cheaper versions of this lamp would have had a plain font instead of the decoratively embossed one. A lamp for the middle class family which would hang above the dinner table, or perhaps in a 'eat in' kitchen.